Thanks to its ability to read two sensors simultaneously, the Centor Touch Dual is a true test console designed for advanced force testing. It offers all the functionality of an efficient force gauge and its calculating power enables it to save values from two different sensors simultaneously and perform calculations on each channel. 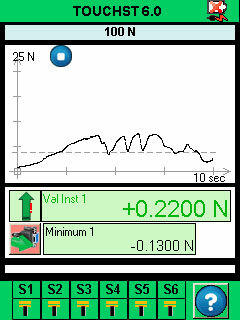 This way you can read the values of two sensors of force, torque, displacement and/or angle. This force gauge is equipped with a force sensor when manufactured. This load cell can be either mounted in the housing (capacities from 5 N to 1.000 N) or outside of the housing with a cable (capacities from 5 N up to 50 kN). This load cell cannot be dismantled from the display. The Centor Dual Touch is also equipped with a SPIP input which permits the automatic reading and recognition of any sensor equipped with this technology. The different sensors available are: force, torque, rotational displacement and linear displacement. 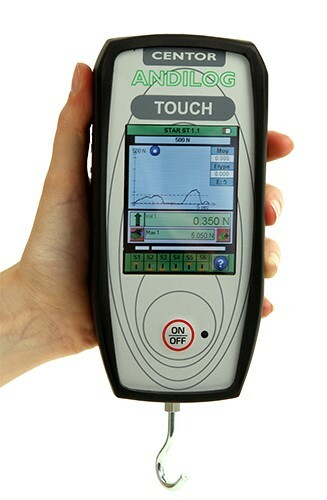 The force gauge Centor Dual Touch has been designed for measurements in an industrial environment. It offers high performance with a great simplicity of use thanks to its digital, colour touch screen. 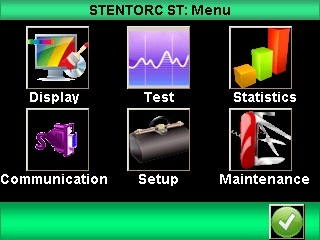 The icons in the menus guide the user in the configuration of its tests. The setup, messages and results are available in English, French, German and Spanish. For a better integration the the manufacturing process and the communication with other devices, the force gauge Centor Dual Touch is equipped with digital and analogical inputs and outputs. These are available on the 26 points connector located at the side of the gauge. Bluetooth - With the Bluetooth module (sold separately), you can remove the connection cable between the computer and the gauge. USB data recorder - With the USB Datastick II (sold separately), you can now save all your measurements and graph directly to a USB memory without connecting to a computer. Analog: sending data continuously at 100 Hz with a voltage of +/- 1.25V. TTL: Interfaces your gauge with a PLC - The Centor Touch Dual model can easily be integrated to an industrial assembly line thanks to its programmable TTL 6 outputs and 2 inputs. Industrial robots are controlled by automate using triggers signals which can be generated through the digital ports of the Centor Touch Dual. Thanks to its advanced features, you can swap load cells by simply disconnecting one cell and fitting another. 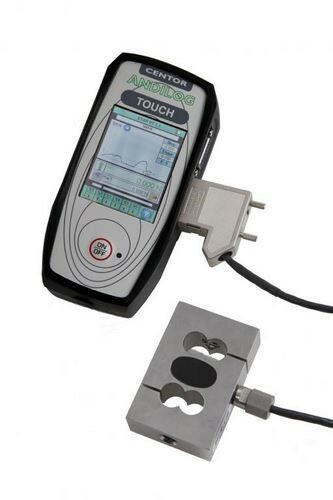 When a new loadcell is connected, the Centor Touch Dual automatically recognizes it (reading the new cell's range, serial number and calibration status). It is the simplest and most complete scalable system for approaching tests in a workshop or laboratory. The full functionalities, the flexibility and the user-friendliness of the Centor Dual Touch makes it the ideal solution in the workshop, for quality controls or for simple as for sophisticated tests, available at an affordable price! The SPIP U9C load cell series is automatically recognized by all the CENTOR TOUCH Star and Dual force gauges and torque gauges, and they can complete a set of force/torque measurements at a very reasonable price.